Remote control specialist Ricavision has announced this rather fetching-looking remote for use with Windows Vista 's Sideshow component. Whether that makes you go 'wooo' or 'oh' rather depends on how much you like the Sideshow concept. In case you don't bother to trawl through the minor details of Bill Gates' keynote addresses, Slideshow is a technology that displays information such as new emails or RSS feeds on a secondary screen. So, on the outside of a laptop, for example, you can see what's new without opening the lid. With the colour screen on this baby, you could potentially keep an eye on new emails or your Messenger contacts while watching a full screen episode of Captain Scarlet. But would you actually want to? And wait until you hear the price - $199 (£100) in the US. Whether it'll be available in the UK remains to be seen, but, to be fair to Ricavision, it's a definite improvement on most of the Slideshow-capable stuff we've seen so far, specifically the monochrome-screened Philips SRM7500. 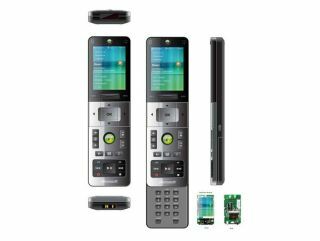 The remote features Bluetooth and has a 100 metre range plus a slide-out number pad. Third parties can program plug-ins for Slideshow, too, meaning it could be quite a comprehensive addition to your remote control armoury. If you haven't seen it yet, also check out the Asus W5Fe laptop with Sideshow.